There are approximately 3.7 crore individuals who are visually challenged across the globe. About 1.5 of them are in India which include students at large. Although they are challenged, students are persistent in order to secure education. Sadguru Shree Aniruddha, thus, undertook the initiative of ‘Aniruddha’s Bank For The Blind’ to provide firm support to their efforts. To his Shraddhavan friends, Sadguru Shree Aniruddha has often said, “We are inadvertently indebted to the society we live in and it cannot be disclaimed. It is only therefore, by lending a helping hand to the needy that, we can repay the debt and perform selfless service for God’s children. The project is an undertaking of a collaboration between ‘Shree Aniruddha Upasana Foundation’ and ‘Aniruddha Samarpan Pathak’. The academic textbooks are recorded in an audio form and distributed to such students through the project. Shree Aniruddha Upasana Foundation has always been empowering such sections of the society, that require support. By making the verse his resolve, Sadguru Shree Aniruddha has brightened the lives of the visually challenged. The Sadguru does not require to perform any magic, but in fact, transforms the darkness into light. The Aniruddha’s Bank For The Blind is an representable instance of it. Through the project, the students receive aid for their study courses. The Seva is offered through the organisation located in Mumbai, India. Over the last 10 years, the Bank has expanded its connectivity across 26 states in India. The neighbouring country of Pakistan is also a beneficiary of the project. The Bank records the study material in 12 languages, which include Marathi, Hindi, English, Gujarati, Tamil, Kannada, Bengali, Telugu and Sanskrit. Up until April 1, 2018 a total of 17,419 CDs had been distributed. Moreover, 461 institutions as also 348 students have individually availed from the bank. The Shraddhavans, who perform the Seva with devotion spare their valuable time for it. They are always prepared to participate in it as it is an initiative of Sadguru Shree Aniruddha. It is for this reason that Shraddhavans from across the country participate. Such Shraddhavans, who are adept at their mother tongue, record the audio books for the visually challenged students. The recordings are then diligently checked. It ensures the quality of the books being recorded in the form of audio CDs, is standardised and also maintains the quality of the audio. The volunteers are directed on how to record and which tone is to be maintained while doing so. The requisite syllabus is recorded only after the institution receives a written application with a demand for its CDs. A permission to reproduce the book’s content also needs to be secured from its publisher(s). Only then are the CDs distributed to the beneficiaries. Occupational training – Motor Reminding, Massage, Physiotherapy, etc. 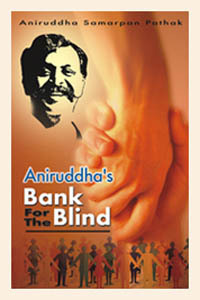 Aniruddha’s Bank For The Blind — 503, Link Apartment, 35th Lane, Old Khar, Khar Road ( West ), Mumbai – 400052.